We have now accounted for the first fictitious force, , appearing in Equation (6.9). Let us now investigate the second, which takes the form , and is called the Coriolis force. Obviously, this force only affects objects that are moving in the rotating reference frame. Here, is the local acceleration due to gravity. In the preceding three equations, we have neglected the centrifugal acceleration, for the sake of simplicity. This is reasonable, because the only effect of the centrifugal acceleration is to slightly modify the magnitude and direction of the local gravitational acceleration. We have also neglected air resistance, which is less reasonable. This deflection is in the same direction as the Earth's rotation (i.e., west to east) and is greatest at the equator, and zero at the poles. A particle dropped from a height of 100m at the equator is deflected by about . Hence, the rotation is clockwise (if we look from above) in the northern hemisphere, and counterclockwise in the southern hemisphere. The rotation rate is zero at the equator and greatest at the poles. The Coriolis force has a significant effect on terrestrial weather patterns. Near equatorial regions, the Sun's intense heating of the Earth's surface causes hot air to rise. In the northern hemisphere, this causes cooler air to move in a southerly direction toward the equator. 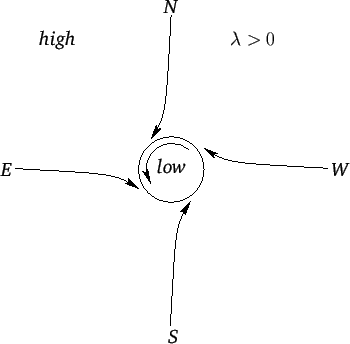 The Coriolis force deflects this moving air in a clockwise sense (if we look from above), resulting in the trade winds, which blow toward the southwest. In the southern hemisphere, the cooler air moves northward and is deflected by the Coriolis force in a counterclockwise sense, resulting in trade winds that blow toward the northwest. Furthermore, as air flows from high- to low-pressure regions, the Coriolis force deflects the air in a clockwise/counterclockwise manner in the northern/southern hemisphere, producing cyclonic rotation. (See Figure 6.3.) It follows that cyclonic rotation is counterclockwise (seen from above) in the northern hemisphere, and clockwise in the southern hemisphere. Thus, this is the direction of rotation of tropical storms (e.g., hurricanes, typhoons) in each hemisphere. Figure 6.3: Cyclone in Earth's northern hemisphere.